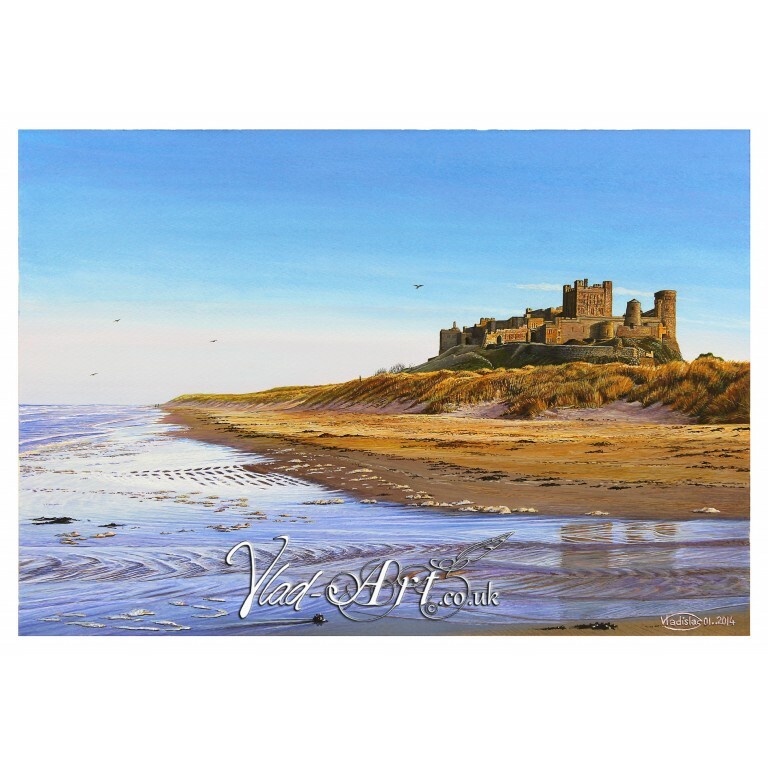 This depiction of Bamburgh Castle is a watercolour painted by Vladislas, offered as a Fine Art LIMITED EDITION reproduction by Vlad-Art, showing in great details the spectacular views of one of Northumberland most iconic site in a colourful and bright day. Bamburgh Castle is in an area designated as Outstanding Natural Beauty on the northeast coast of England, in Northumberland meaning “the land north of the River Humber”, nearby the village of Bamburgh only a few miles from Lindisfarne Castle on Holy Island, earning to be called the "cradle of Christianity" because Christianity flourished on Lindisfarne. Shakespeare made one of the Percy’s family who lead many revolts in this Bamburgh area, the dashing Harry Hotspur, the hero of his Henry IV. Northumberland, unsurprisingly, is irresistibly visited due to its scenic beauty and the abundant evidence of its historical significance. This painting holds the stunning contrasting colours of yellow ochre, blues and mauves, giving Bamburgh a royal seal of beauty as many have witnessed the awesome stature of this imposing bastion. Buying a limited edition artwork from Vladislas couldn't be easier, just add your chosen art print to your basket and follow the easy on screen instructions to checkout. Your fine art print will be dispatched in secure packaging.